Many different organizations across just about every industry rely on professional services for machining precision components. The importance of working with a reputable, reliable, and quality precision machine shop cannot be overstated. 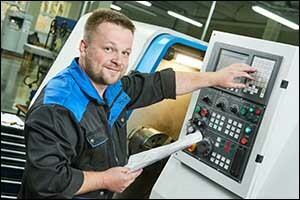 Computer numerical control or CNC machining can enhance the manufacturing process. There are many advantages to choosing Massachusetts precision machining for your project compared to other manufacturing alternatives, such as 3D printing or conventional machining. Some of the benefits of working with Massachusetts machining and assembly professionals are more obvious than others, such as being more accurate, efficient, and cost-effective compared to other methods used in development. However, once you start looking into the services that you can get with a machine shop in Massachusetts like AMI Machining, the advantages become even more clear. The key to machining precision components is precision. The major appeal of working with a precision machine shop that utilizes CNC machining processes is that instead of using an operator to control the manufacturing functions of the machine, CNC machining relies on technology. Pre-programmed software and connected consoles are used to monitor quality control and consistency for every single machine within our facility. When you require Massachusetts machining and assembly for your business, the process of pre-programmed software and quality control measures can be applied to everything from milling to turning and just about any necessary piece of machinery. In addition to these technology benefits, CNC machining provides additional options, including multiple axes, which can be used to accommodate an unlimited array of angles and tight tolerances. CNC machining can be used at our Massachusetts precision machining shop with a wide variety of materials, including those that can be otherwise difficult to cut. It is the perfect choice for machining 3D shapes that can be too complex for manufacturing using conventional machining processes. CAD and CAM software is commonly used to provide the specifications required by the customer. The code can be updated as needed to make corrections and improvements to the product or to further customize the prototype. Another advantage of working with professional Massachusetts machining and assembly service providers is that there are many options available at our precision machine shop. As a result, even the most complicated prototypes can be completed within minutes. At AMI Machining we do everything in-house at our one-stop shop located in Southeastern Massachusetts. We provide services for clients throughout the northeastern region and all across the country. Our team of highly trained engineers and technicians work with a wide range of machines to ensure the best possible results. Basic machines are available for simple orders, but more advanced machines are used for complicated requests. Multi-axis machines are used to turn or flip the material automatically as part of the pre-programmed process at our precision machine shop. This eliminates the need for human or manual intervention, providing a more accurate result. Some of the machines that we use include HAAS, Brother, Quaser, and Robodrill machines for milling; HAAS trunnions and rotaries for 4th and 5th axis machining; Turnex, HAAS, Okuma, Hardinge, Monarch, and Mori Seiki CNC turning lathes, and a broad range of quality control machines. Our team uses coordinate measuring machines from Zeiss and Bendix along with a J&L optical comparator and height gauges from Micro-Hite, Tesa Hite, and Fowler. When you hire our team at AMI Machining to provide you with top quality services for machining precision components, you can count on us to deliver results designed to meet or exceed your expectations. Our services can include production, assembly, milling, turning, and custom prototype development through our skilled force of engineers and technicians. We are ISO 9001 certified, use only top of the line state-of-the-art equipment, and utilize 100 percent verification at each production interval. Our team ensures continuous in-process inspection and our equipment is regularly calibrated for excellence. We take pride in offering services to our customers that exceed industry standards and appreciate the loyalty that we receive in return. Our one-stop machining and assembly solutions have been designed to help our clients reduce manufacturing costs and to provide continuous process improvements. Our machine shop in Massachusetts has the unique ability to offer rapid response prototyping and consistent production runs that go above and beyond expectation. We are also ITAR registered, veteran owned, and have embraced lean manufacturing techniques to ensure continuous improvement within our precision machine shop. Contact our team at 508-947-1192 to speak with one of our engineers or technicians about your needs or to place an order for our Massachusetts machining and assembly.